Once again, I have been side-tracked into another J-craft. I officially cannot resist pretty things. Not even a little bit. These are seriously awesome, though. 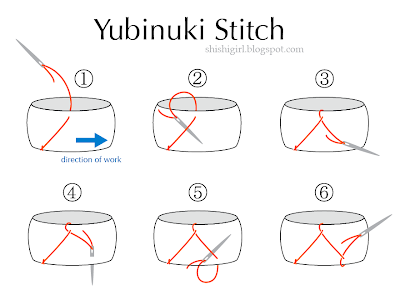 The word yubinuki simply means "thimble" in Japanese. 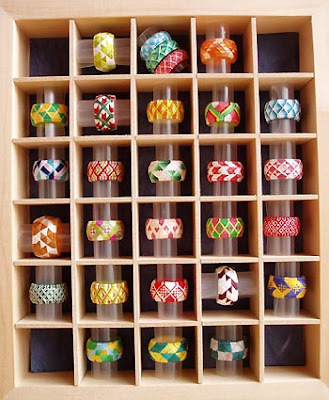 It can refer to the bucket thimbles we're accustomed to in the west, leather cuff thimbles, metal pad thimbles, or any one of several "thing that goes on your finger when you are sewing" accessories. What we've specifically got here are kaga yubinuki (加賀指ぬき). They are padded fabric rings decorated with silk thread. 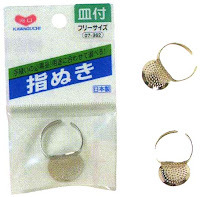 The origin of this style of thimble is credited to the Kaga region of old Japan, modern day Ishikawa prefecture, hence the term kaga yubinuki. 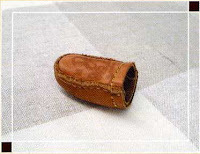 When the term "yubinuki" is used in English, it is almost always in reference to this unique type of embroidered thimble. 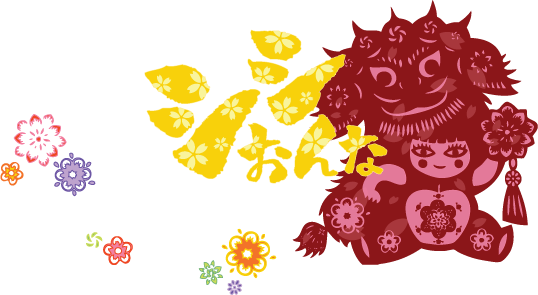 I discovered yubinuki by way of a related craft called temari (てまり), a topic upon which I really, really hope to do a tutorial soon. 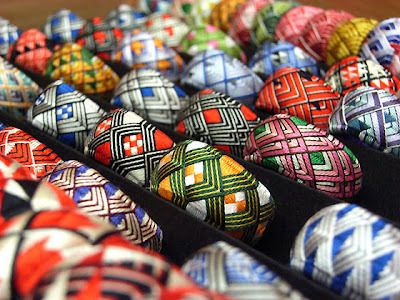 The two are related in that they both apply colorful geometric patterns of silk thread to a padded, curved surface. 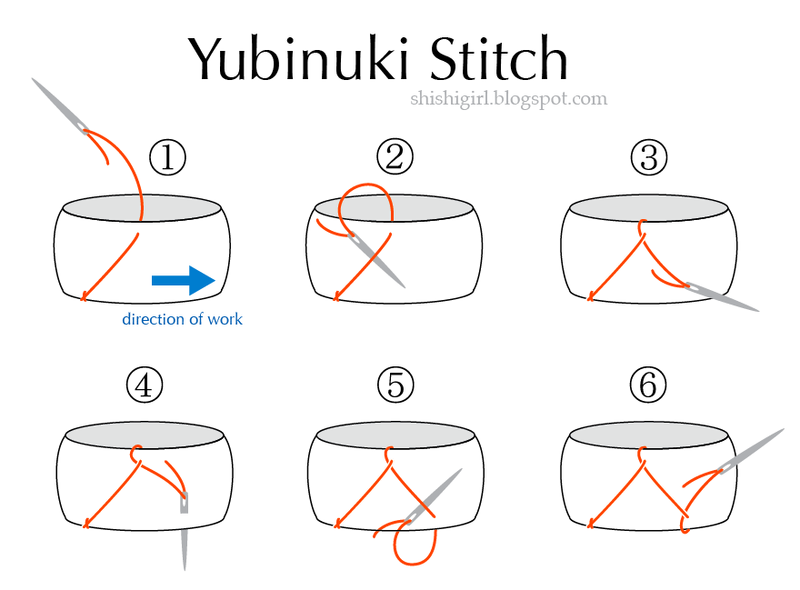 Yubinuki, however, are easier in my humble opinion: there are fewer divisions to keep track of, only one stitch to remember, and they are generally much smaller. If you can read Japanese, here is a simple tutorial all on one page. A more complete tutorial and the pattern to make the double yabane (arrow-tail) pattern can be found here. Even if you don't read Japanese, it's worth a look at just the pictures in each tutorial -- you'll quickly get the feel for what is being done. THANKS FOR THE INFORMATION ABOUT THIS TECNIQUE, THAT IS THE FIRST TIME I GET IN TOUCH WITH.. I WOULD APRECCIATE ALL THE KINDLY INFORMATION YOU CAN SHARE.. ITS REALY BEAUTIFUL!! Hi. Are there places you can buy these readily made? I don't think I have the time or skill to attempt this right now, though I'd like to.